A cluster of beautiful Vendela roses in a Chinese tea pot. We make floral teapot arrangements and offer flowers in Chinese earthenware, decorative teapots with flowers, and Chinese teapots with flowers. 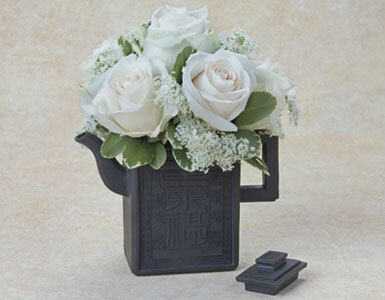 We promptly deliver your teapot with flowers to your home or office in Beverly Hills, West Hollywood, Santa Monica, and greater Los Angeles area.